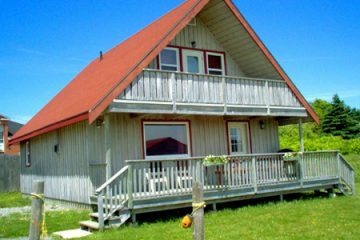 Ocean Mist Cottages boasts one of the best beachfront locations in all of Nova Scotia with six fully equipped, two bedroom, oceanfront units that promise to meet your every expectation. The tastefully decorated interiors of our beachfront cottages create a cozy atmosphere that is bound to please. You’ll find pine cathedral ceilings and locally crafted pine furniture with all the amenities required for a comfortable stay. Garden doors open to a spacious deck overlooking Crescent Beach where you’re only a stones throw away from the Atlantic Ocean. Each of our cottages has a BBQ, picnic table, deck chairs and outside fire-pits. Interested in peaceful walks on a fine white sand beach where the only sounds you’ll hear are the rolling surf and the laughter of children? 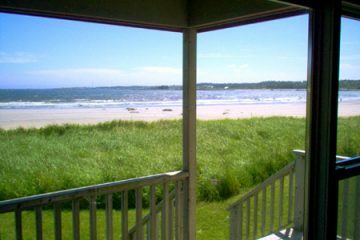 Spend your days lazing on famous Crescent Beach in Lockeport, Shelburne County, Nova Scotia or relaxing with a book on the deck of your cottage rental. This mile long white sand beach is never crowded yet provides endless hours of enjoyment for those who visit year after year….whether for an hour, a day or a week. The picturesque island town of Lockeport is joined to the mainland by Crescent Beach and its causeway. It is renowned for its fine white sand beaches and friendly people. With a population of around 600, the community is rarely busy except during its summer festivals -The Shelburne County Lobster Festival, Lockeport Canada Day Celebrations , Harmony Bazaar – Festival of Women and Song and the Lockeport Sea Derby. If you’re tired of crowds, and longing for solitude with a little adventure, this is the place for you and your family. Come experience what so many others have grown to cherish….life in the slow lane. Dates of operation will be found on their site. The ferry from Saint John NB to Digby NS is still operating. Only steps from the beach, we offer 5 ocean front cottages and a chalet style cottage with a panoramic ocean view that provide breathtaking views of Crescent Beach and the Atlantic Ocean. Each of our cottages is fully equipped including a four piece bathroom. The kitchen features a refrigerator, stove/oven, microwave, coffeemaker, pots and pans, dishes, utensils, etc. The living room comes equipped with a sofa, chair, rocker, flat screen cable TV and a propane fireplace. Visitors can also access free wireless high speed internet. To inquire about availability or to ask a question about our Cottages, please use the form below. By checking this box, I agree to the cancellation policy. 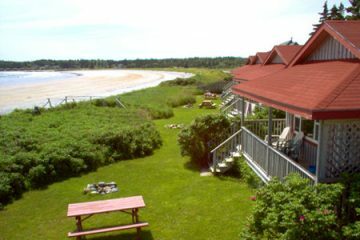 Ocean Mist Cottages boasts one of the best beachfront locations in all of Nova Scotia with six fully equipped, two bedroom, oceanfront units that promise to meet your every expectation. The tastefully decorated interiors of our beachfront cottages create a cozy atmosphere that is bound to please. You’ll find pine cathedral ceilings and locally crafted pine furniture with all the amenities required for a comfortable stay.